After 4 hours of discussing our future marriage in Pre-Cana, Steve and I were ready for a drink and a snack. It was 9:30pm, and the snow was coming down hard so we opted for a place up the street from the Church. Despite the good reviews, I was weary when we walked in. City Streets looks and feels like a generic suburban restaurant, trying to be all things to all people, serving a vast array of items from burgers, flatbreads, quesadillas to chicken piccata and pot pie. 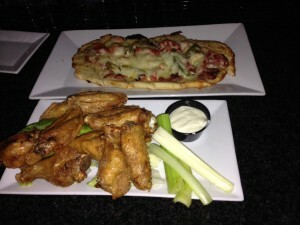 I was surprised; the wings were crispy and meaty, and the flatbread had a crispy crust and fairly flavorful toppings. Despite the decent fare, I would still recommend you go to Redbird if you are in the Waltham area and are hungry.